Real. Reliable. Texas Public Radio. Students Meghan Lanell and Kelly Roper looking through their dig for artifacts. 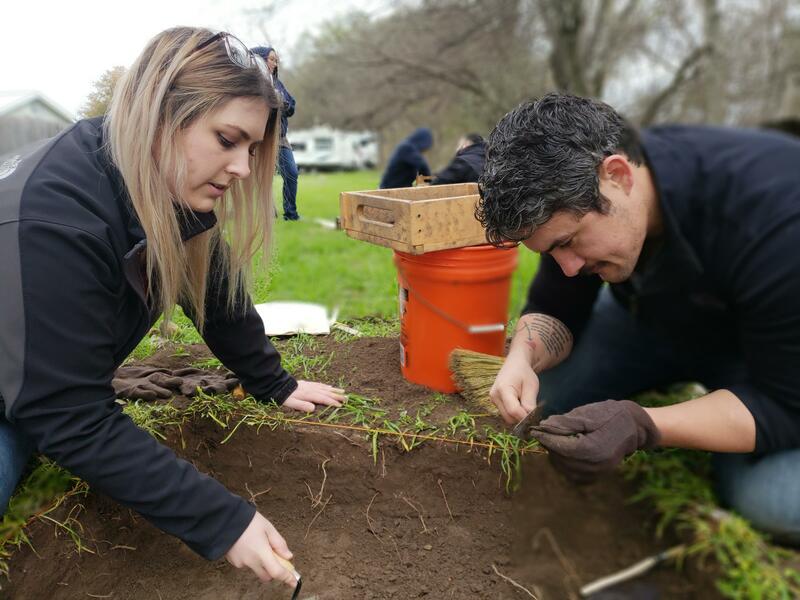 A group of archaeology students from Northwest Vista College hope the grounds of an RV resort near Von Ormy yield some clues about ancient humans who lived along the Medina River. Half-a-dozen students were working Friday in 30-degree temperatures with picks, trowels, hand brooms, and dust pans, slowly removing levels of dirt. In a wooded area near the Medina River in the Alamo River RV Resort, they staked out small areas to dig. Sophomore Victoria Whitt and her dig partner already found something, but it's not ancient. "Right now we're just trying to get through the tree roots and my dig partner, Vanessa, found a ring," Whitt said. "And at first, I thought it was a construction ring that you sometimes (use to) pull out nails and stuff, but it looked like a jewelry ring and I cleaned off the front edge and it had two initials and it was S.W." Their class instructor, Whitney Lytle, hopes much older artifacts will be found in the weeks ahead. She said the area has a lot of potential for finds, since rivers are known to attract humans through the ages. She said students have already found tiny stone flakes, chipped away by an ancient toolmaker. The resort has been owned since 1993 by Charlie Brown, a retired commercial air pilot, who most recently flew for billionaire investor Warren Buffet. 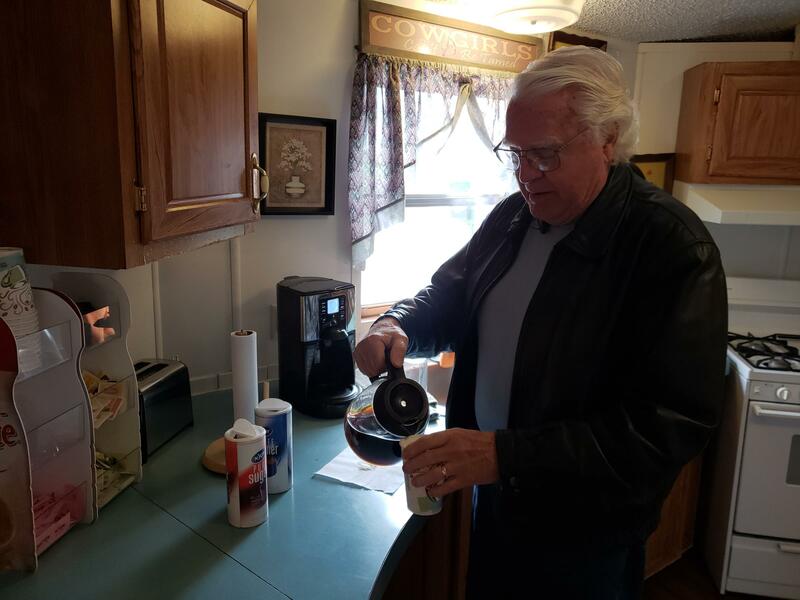 Alamo River RV Resort owner Charlie Brown pours a cup of coffee to help start the day. Brown allowed the students in for the dig. He's a bit of digger himself. Brown and visitors to the RV park have used metal detectors in the past to unearth stuff. "I got a couple of big boxes of things," he said. “They include cart parts, buggy parts. I found a piece of a shotgun down on the river bottom. A lot of farm implement tools and stuff like that." Any artifacts found will belong to Brown, but he will share them for display by Northwest Vista College. He said the 100-acre property also includes a tree called the Santa Anna Oak, where the Mexican general may have encamped during his march north to the Alamo. He said experts at UTSA told him the tree is six-hundred years old and 12 feet in diameter. Brian Kirkpatrick can be reached at brian@tpr.org or on Twitter @TPR Brian. Indian tribes with possible ties to Frio County around 1,000 years ago are being contacted by state officials to determine what to do with the remains of a Native American found under a bridge, according to the Anthropology Center at Texas State University in San Marcos. To kick off Texas Archeology Month, City and State officials have unveiled newly discovered historic artifacts Friday. The relics come from the site of Presidio de Bexar, and the probable site of the Mission San Antonio De Valero. It’s the first time either site had been excavated. The finds include an assortment of ceramics, glass, and wrought metal nails.